HAPPY THANKSGIVING! This blog entry covers the week of Thanksgiving and the week after, since we only see each other for TWO DAYS next week! We will continue to strive for excellence as we complete our investigation of linear momentum. We will study the role of kinetic energy in different types of collisions by taking some AWESOME and INSPIRING notes, doing our last homework of the unit, doing some EXCITING practice problems, and conducting a RAD experiment! Then we’ll take our momentum unit test. Woot! Next up: circular and rotational motion #thankful! For Monday, please complete goal set 1 from unit 3. We will take a quiz over this goal set on Monday. Please take notes on Video 2: Friction by the date announced right here for your class period: 3rd and 11th periods due Monday, 1st period due Tuesday. We will go over this topic, do assignment 2, do a spectacular experiment, and when announced take a quiz over goal set 2. Following that, if announced, please take notes on Video 3: Elastic Force. It will be fabulous! #thankful! Meet the Balloonatics! This is the team of people who engineer the balloons for the Macy’s Thanksgiving Day parade, and believe it or not, they use PHYSICS…some of the same physics we’ve been learning, in fact! Here’s a short video from Science Friday that shows you how it’s done! Below the video I’ve included the science of cranberries, which I think is really cool. The science of CRANBERRIES! I don’t know about you, but I LOVE to make homemade cranberry sauce for Thanksgiving. 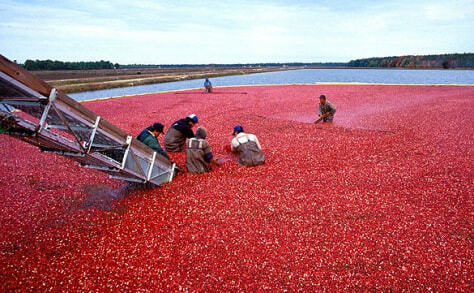 Did you know that cranberries are grown in BOGS? They’re grown on vines like strawberries, but they thrive if those vines are planted in wetlands. That’s cool. Also, 60% of our cranberries come from Wisconsin, while 25% come from Massachusetts, and if you have the chance to head out to those states, you can go to a cranberry farm (like we go to blueberry, raspberry, and strawberry farms here.) Here’s a little more information and a couple of awesome pictures. This entry was posted in Uncategorized by Mrs. Burgess. Bookmark the permalink.